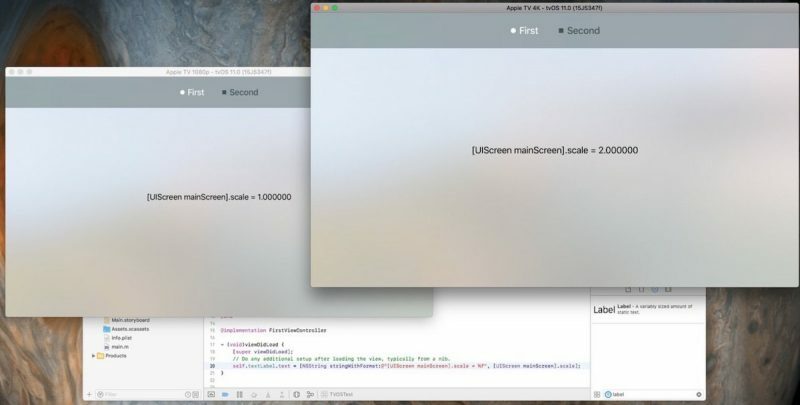 Developer Steve Troughton-Smith today shared the spoils of his latest hacking efforts by tweeting screenshots of Apple's tvOS Simulator running in 4K – the screen resolution said to be supported in a rumored fifth-generation Apple TV. 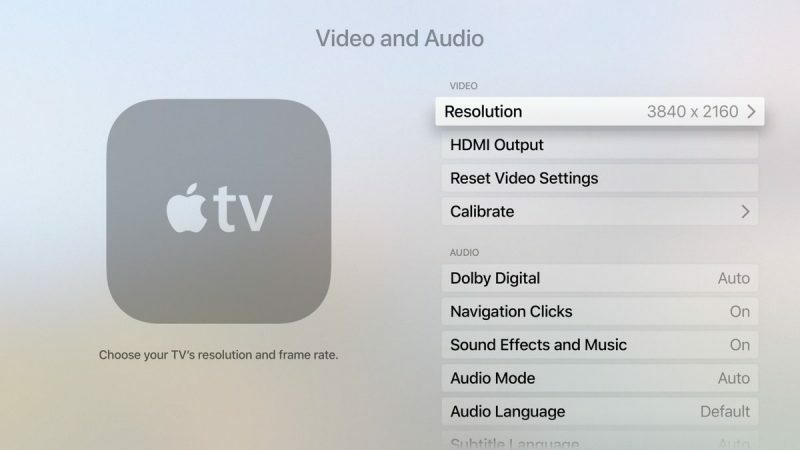 tvOS is officially made to run in the standard 1920x1080 HD resolution, but what Troughton-Smith's hack shows is that the Apple TV operating system is perfectly suited to running at double the pixel density (3840x2160), commonly referred to as 4K resolution, thanks to user interface assets like text and icons that are made to scale cleanly given the same aspect ratio. The simple scale doubling is reminiscent of the 2x iOS asset resolution requirement that Apple introduced back in 2010 with the arrival of Retina displays, and comes at a time when Apple is rumored to be readying a new, fifth-generation Apple TV capable of streaming 4K video. Just last weekend iOS developer Guilherme Rambo discovered a reference to a 4K HDR display mode in the HomePod's firmware, which has proved a trove of hints related to Apple's upcoming hardware releases. MacRumors subsequently discovered the string J105a in the HomePod firmware, consistent with the fifth-generation Apple TV's internal codename first revealed by Bloomberg in February. Additional strings unearthed in the code also suggest a forthcoming Apple TV could support both the Dolby Vision and HDR10 color formats for high-dynamic range video. Adding further fuel to rumors of an imminent 4K-capable Apple TV, Apple recently listed selected movies as 4K and HDR in iTunes purchase history. While the content is still only playable in standard definition or HD, the change suggests Apple is preparing to offer the higher definition formats for a new TV box. The launch date is unclear for a possible new Apple TV, which has been rumored since December 2015, but given the recent uptick in references to 4K resolution by Apple, it's not unreasonable to suggest the company could be readying a release for the new TV box before the end of the year. Experts have found that for you to see a difference between 1080p and 4k, you need a giant 80" TV and sit as close as 6.5 feet. Short: Nobody needs 4k, you can't see it. It's a marketing gimmick. HDR on the other hand, makes a real difference. 4K TV owner here. I can see the difference sitting 8ft away from my 55". It's so smooth and gaming jaggies are reduced massively. Everything you have said was also said when 1080p TVs were new. It bothers me that this is a big deal. The apple I remember woild have released the ATV 3 in 4k. Multiple years ahead not barely scathing behind. This is complete nonsense, sorry. So you think they would have released a 4K Apple TV in March 2012? I was also disappointed that the fourth Apple TV was 1080p only. However, the WWDC keynote showed me that they are clearly aware of 4K, but they needed one big thing to arrive: HEVC. Without it, the bandwidth required to watch 4K would have been too high. Apple states that you need 8 Mbit/s for streaming content in 1080p, while 4K eats up the bandwidth. Roku states that you need up to 25 Mbit/s. That's way too much for Apple standards and the only way to bring it down is by using HEVC. They had to wait for it, and the next Apple TV will be unveiled this fall with 4K content on iTunes, being the first 4K streaming box which has no gigantic requirements for streaming 4K. Wow, just WOW. Who are these experts?????? Just because YOU can't see the difference doesn't mean NOBODY can. Your post is everything that is wrong with the internet. Arrogant people commenting on stuff they clearly know NOTHING about. The larger the display size the better the viewing experience, but that's also true of 1080P. So yes, clearly an 80 inch TV will really show it off, but in REALITY 4K is amazing on TVs generally 50 inch and above. If you watch ANYTHING from 6.5 feet it will look "good." I personally have a very nice 55 Inch 4K HDR TV and I can say I CAN see the difference. Depending on what I'm watching it is NIGHT AND DAY different and BETTER. So please don't tell me what MY experience is and what I need and do a little research before spreading your "forceful," "self-assured" ignorance. Let's drop the angry bickering over pointless things and be happy we're finally getting a 4K HDR Apple TV. I mean, do you have a 55 inch 4K next to a 55 inch 1080P? Actually, I did have my 65" 4K TV right next to my 65" 1080P TV when I first purchased the 4K set. It was night and day difference with video that was made for 4K. Even my wife, who will happily watch a old SD show and could care less about HD was amazed. I do agree that HDR adds even more on top of 4K, but 4K alone is stunning. What do you do with a cow? Love how the only person talking sense is getting bashed by everyone – even people who think that resolution could benefit a smooth image. LOL. There should be absolutely no debate about 4K and 1080p. Your eye can’t see the difference unless the screen is really close and/or huge. If you think you can see a difference, bravo, that’s how marketing works. Any difference you really see is just years of display technology having developed ahead, and these displays also feature 4K, but it isn’t the thing making everything better.